In another step towards the conclusion of a two decade saga, Nassau County Executive Ed Mangano awarded Nassau Events Center (NEC) the right to develop the Nassau Coliseum. NEC, an affiliate of Bruce Ratner’s Forest City Enterprises, Inc, beat out competing finalist Madison Square Garden Company. Following a final approval by the Nassau County Legislature and the Nassau Finance Interim Authority (NIFA), Ratner’s $229 million proposal will get underway to renovate a 13,000 seat Coliseum, a 2,000 seat indoor theater, an outdoor amphitheater, restaurants, an ice rink, and retail space. The icing on the cake for the Nassau Events Center would include 6 Islander home games during the season. Like many other things in life, money was the deciding factor in the decision. “In conclusion, the Committee viewed NEC’s willingness to accept, at Islanders/SMG lease expiration, immediate financial and managerial responsibility for the Coliseum at its sole expense, to pay rent to the County before and during construction, and to pay a measurably higher annual minimum rent with higher escalations as primary characteristics that contributed to distinguishing NEC’s commitment and confidence from the proposal submitted by MSG” said Mangano in his official statement. Looking at the numbers, Madison Square Garden (MSG) wasn’t even in the same ballpark as NEC. Not only will Ratner and friends pick up the bill on all pre-construction and construction expenses, as well as give the County rights to all future on site developments, their 4.4 million annual rent came in well above MSG’s proposal (3 million per year). Finally, NEC’s minimum rent would escalate at a 10 percent rate every 5 years as compared to MSG’s rate at 5 percent. It really wasn’t even close. Behind Charles Wang and John Tavares, Bruce Ratner may be the most important figure in Islanders’ hockey right now. – Is there a catch with Ratner, or is he really that good of a guy? In Mangano’s official statement, he puts it right there in the first sentence, “100% privately financed Coliseum that will share revenue with the County at zero expense to the taxpayer.” On paper, Ratner is paying for everything, and splitting the revenue with Nassau County. It almost seems too good to be true. Does he really believe in the area this much? As of now, I have to buy into the guy. He has done nothing but show support for the organization and area since his initial involvement 10 months ago when he researched the profitability of the site. 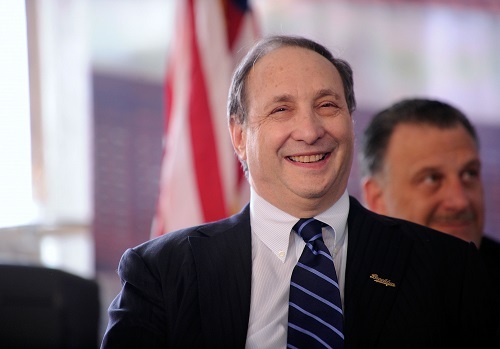 – Bruce Ratner is officially MSG East! With control over the Barclay Center and possible control over the “new Coliseum,” Ratner has cornered the entertainment market east of Manhattan. Summer concerts at Jones Beach are the main competition. This guys got power, real power. – This will be approved, right? With no expenses and all profit, plus Mangano’s backing, I can’t see any reason the Nassau Legislature and NIFA will not approve. – I feel bad for Chuck…sort of: Charles Wang has done nothing but act in the best interest of the New York Islanders. Most owners would have jumped ship by now, but Wang has been nothing but positive with the dismal situation. It is frustrating though to think Wang could not work with authorities to get this done years ago. Wang was never willing to budge on the scale of his $3.8 billion Lighthouse Project. This also is probably the answer to the “why now?” question many have been asking.